Daniel has received his prices for winning the June competition. He’s happy! 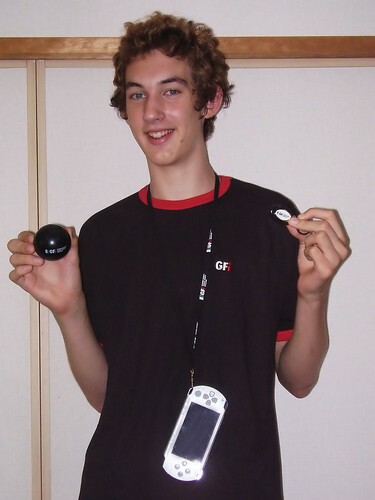 I want a silver PSP too *sigh* so sad they give it to other people haha. So keep commenting guys and keep up the good discussion, in the world of blogs you ‘tip’ the author by leaving comments. It makes us happy and when we happy we post more good stuff. You can stand a chance to win something cool, backbone won in July and August competition is still on-going. And of course many thanks again to GFI for sponsoring these great prizes! Excellent stuff indeed :) It’s good to see the actual photos of the commenters happy and content with GFI goodies :) Thanks Daniel for sending in these pics. Guys keep the comments coming and who knows… it could be you next! ….wow. its me. i feel, sorta famous. in a sorta odd way. Real neat. Congrats. 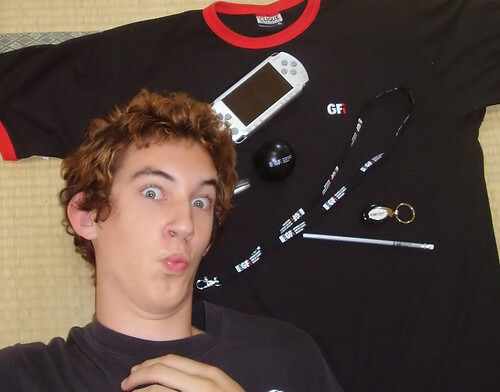 I personally like the PSP and the keychain. Though i got to admit, the t-shirt looks a little plain, could do with some slight designs or something. I actually like the T-Shirt! I’m a sucker for the T’s with the rings. Hah, Daniel is teh famous!